Philip Morris was born Francis Charles-Philip Morris in Duluth on January 20, 1893. His parents were Alphonsus L. Morris and Celia Matteman. Alphonsus was born in Canada about 1865 and first appears in the Duluth directory in 1890, living at 706 East Fifth Street, but he moved frequently in the next couple of years. He worked at various jobs, mostly as a traveling salesman for such products as Wooding’s Rheumatic Oil and the American and English Encyclopedia of Law. He apparently left Duluth around 1895. Celia was born around 1870 in Minnesota. She is listed in the 1885 Minnesota census living in St. Paul with an O’Leary family. It’s not clear when she came to Duluth but was obviously in Duluth in 1893. She appears in the 1900 census in St. Paul with Francis and another son, Arnold Joseph Morris, who was born in St. Paul, Minnesota, on June 7, 1896. Alphonsus is recorded as Arnold’s father. It’s not clear when Francis went to California, but in the 1920 census he’s listed living in Los Angeles with his wife, Helen, and her father John Reubhausen. The census lists two children, Dorothy (5) and Jack (3). Francis is listed as Frank C. Morris, and his occupation is “commercial traveler,” or more commonly traveling salesman. By 1930, Frank’s occupation is “actor” in the theater. He began his movie career, and adopted the screen name “Philip Morris,” in the 1931 short drama Framed. Between that role and his death, he appeared in about 110 movies. He acted in small, uncredited roles in Citizen Kane (1941), playing a politician; in The Magnificent Ambersons (1942), playing a policeman; and in It’s a Wonderful Life (1946). He often portrayed a policeman or detective in films. He did receive credit for some roles, including playing a guard in the mystery Return of the Terror (1934) and a U.S. Marshal in the 1948 western West of the Pecos. In his final film appearance, he played a bartender in The Flying Saucer (1949). 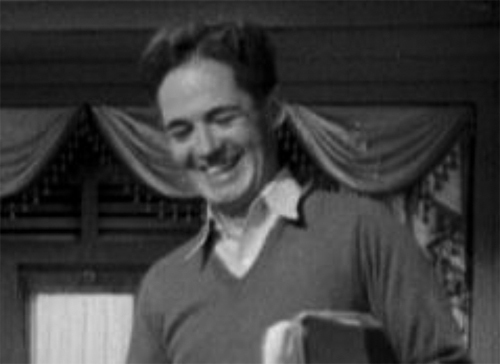 Philip Morris died in Los Angeles on December 18, 1949, just a few months after filming The Flying Saucer. His father, Alphonsus, who eventually married a woman named Hannah and worked as a real estate agent, died in Warren, Oregon, on January 18, 1944. Philip’s wife Helen died on July 5, 1974, at the age of 78. His son, Jack, became a captain in the Los Angeles Police Department. His daughter, Dorothy, is the mother of artist Adrian Saxe.